ly line rips the river’s surface like scissors sliding across silk as Michael McLellan propels his two-handed, Scottish-style fly rod across the blue-green waters of the upper White River. As the line slices through the air, its loop unrolls gracefully until the fly plunks, momentum spent, into the murk on the back side of a current break. 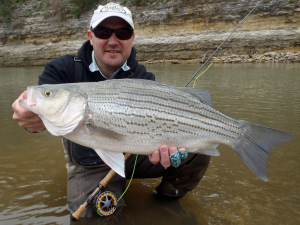 Minutes from downtown Fayetteville and far from the dams and tailwaters that have rightly made Arkansas famous among fly fishers, McLellan seeks not trout, but their very distant relatives: the river-running, spawn-happy white bass. Such a spectacle would have been unheard of 15 years ago. The yearly white-bass run, in which hundreds of fish charge upriver out of Beaver Lake to spawn, was a known phenomenon, but the traditional Ozarks way of fishing for them was to float the river in metal johnboats, casting small lures or live worms with conventional spinning tackle. Fly fishermen were handcuffed, as brushy banks and tight confines made overhead casting unproductive except on a handful of wide shoals, which quickly became crowded during the height of the spawning run. Moreover, fly-fishing was widely viewed as a trout fisherman’s game. In short, fishing the white-bass run was a meat-and-potatoes affair, a blue-collar endeavor for a rough-and-tumble fish. Back then, McLellan was studying for a master’s in literature while managing what turned out to be a short-lived outdoor specialty store with a fly-fishing department. When that store folded in 2003, he opened McLellan’s Fly Shop in Fayetteville and immediately began cultivating a local, flexible fly-fishing culture founded not so much on trout but on whatever was available. And on the upper White, that meant white bass. Convincing local anglers to forgo trout in favor of white bass was a tough sell. On the state’s trout streams, wide-open gravel bars in all directions gave both new and experienced fly casters plenty of room to swish their flies. On the upper White, high banks and deep channels meant that wasn’t realistic, leaving McLellan with something of a conundrum. How could he expect a new generation of anglers to target this blue-collar fish with trout tactics developed for a much different environment? An experienced Western-steelhead and salmon angler, McLellan recognized a potential solution in the two-handed fly rod, which was becoming increasingly popular in the Pacific Northwest. 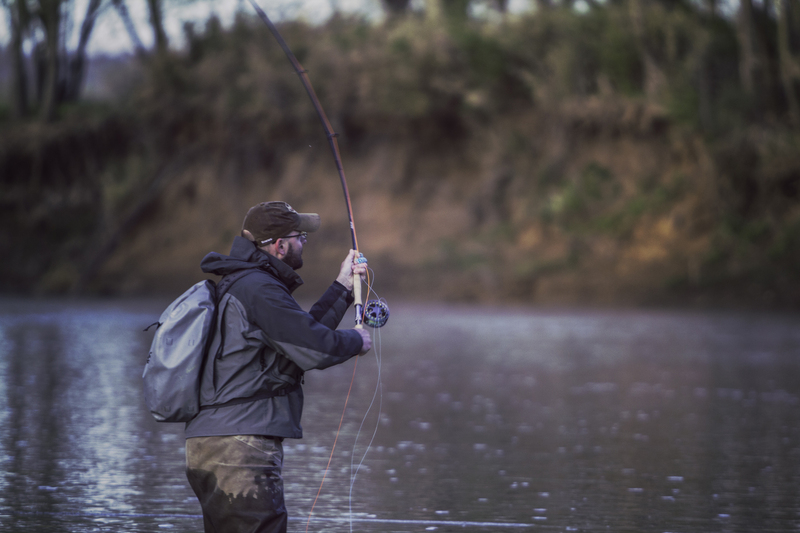 The two-handed rod allows the angler to “Spey” cast, so named after the River Spey in Scotland where the style developed. Spey casters with two-handed rods don’t need room to backcast, so they can deliver a fly even if a downed tree is right behind them. The technique had proven successful for McLellan on salmon streams. And because salmon behave in much the same way as white bass—making an annual pilgrimage to the shallow rivers of their birth to spawn—and because the conditions in which Spey casting for salmon developed are similar in many respects to those on the upper White, McLellan’s hypothesis had real potential. Taking a chance, he began to stock two-handed rods, never before seen on Arkansas waters, in the hopes of reeling in a few of the hundreds—and even thousands—of white bass, striped bass and their hybrids heading up the White River as the waters warm each spring. To tap into that bounty, anglers would need to learn an entirely new style of casting. Arkansas anglers quickly learned that Spey casting has a separate rhythm from traditional overhead fly casting. The rods are much longer, typically 11 to 15 feet instead of the classic 9. 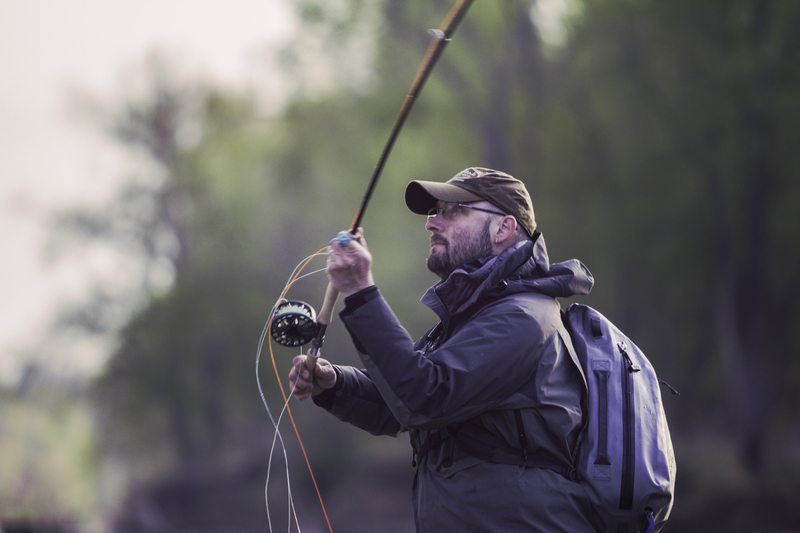 Instead of elevating the cast and aerializing line above the water in a back-and-forth tempo, the Spey cast develops by leaving the tip of the fly line floating on the surface. Thus anchored, the Spey caster can weave an intricate and beautiful series of loops near the angler’s body, ultimately culminating in a powerful “roll cast,” which—executed properly—can pluck the fly from directly in front of his feet and propel it 100 feet or more across the water. Imagine this: rolling out of bed with a wood stove warming your own wall tent, bacon frying on the stovetop, with a stack of two-handed rods leaning against a tree and the white bass breaching the surface just yards away, knowing that you and your closest friends will spend the day swinging flies and landing fish after fish after fish. That dream is now a reality—a unique endeavor that is one part Scotland, one part Portland and one part Arkansan innovation. This article originally ran in the March 2015 issue of Arkansas Life magazine. All photos courtesy Michael McLellan and McLellan’s Fly Shop.